The workshop aims to explore new ways of Nordic interaction on technical issues and policy perspectives in relation to climate change adaptation. 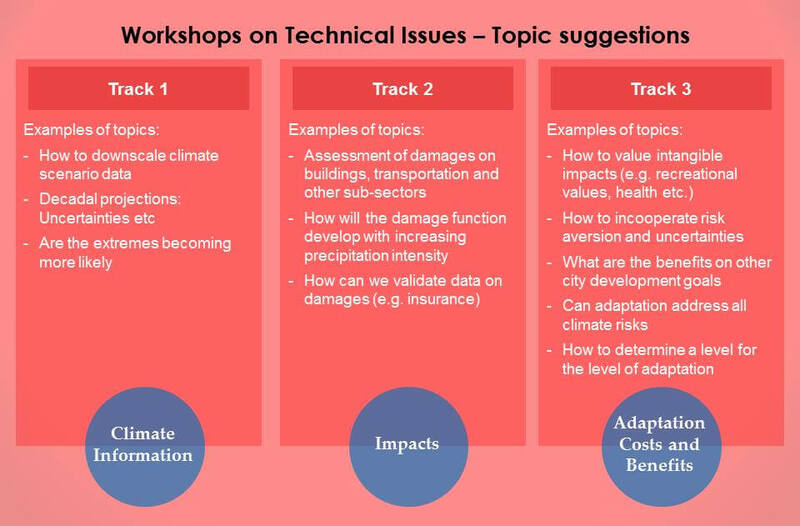 Technical issues and decision making approaches will be addressed in relation to for example climate information, damage assessments and climate change adaptation with a focus on flooding from extreme precipitation. Plenary sessions addressing joint perspectives and priorities will interchange with a knowledge creation bazaar where cities and utilities bring specific problems to the table and interact with experts and colleagues. City cases of adaptation planning will be discussed and we will learn from and inspire each other. Registration: If you would like to participate, please sign up using this link. 9:30 – 10:00 Registration and coffee. 10:00 -10:30 Welcome and introduction with presentation of participants and experts. 10:30 –11:00 Cities in the context of global climate challenges and sustainable development. Keynote presentation by Director John M. Christensen, UNEP DTU Partnership. John will also share his views on COP22 in Marrakech and on international city partnerships. 11:00-11:30 The city adaptation planning landscape: Data, analytical tools, costs, priorities, and uncertainties. Presentation by Professor Kirsten Halsnæs, DTU. 11:30 – 13:00 Case presentation by the participants: Hot topics in urban adaptation plans in the Nordic countries: What are the strengths, and where is more progress needed? 13:45 – 17:30 Knowledge Creation Bazaar I on topics suggested by participants. Participants are invited to propose specific subtopics within these three tracks when signing up for the workshop, based on their specific interests, and subgroups of four to eight participants will be formed at the workshop. Selected experts will support each of these topic groups. Examples of potential sub topics are listed in the figure below for inspiration. Feedback from groups on problems and solutions. Group work on technical issues related to city cases, where groups are formed based on common problems, which will emerge from the Knowledge Creation Bazaar. 13:00-14:30 Presentation of city cases based on the group work, with a focus on technical needs and decision making in the context of a sustainable development agenda. 15:00 – 16:00 Plenary/panel discussion on how Climate-KIC Nordic and city interactions in the Nordic region can continue the shared knowledge creation process on climate change adaptation in cities. Network activities and specific project ideas, for example in relation to funding instruments like Horizon 2020, may be brought forward. A panel with city representatives and climate experts will lead the discussion. If you have questions about the programme or if you have ideas for relevant topics, please get in touch with Kirsten Halsnæs, DTU Management Engineering.